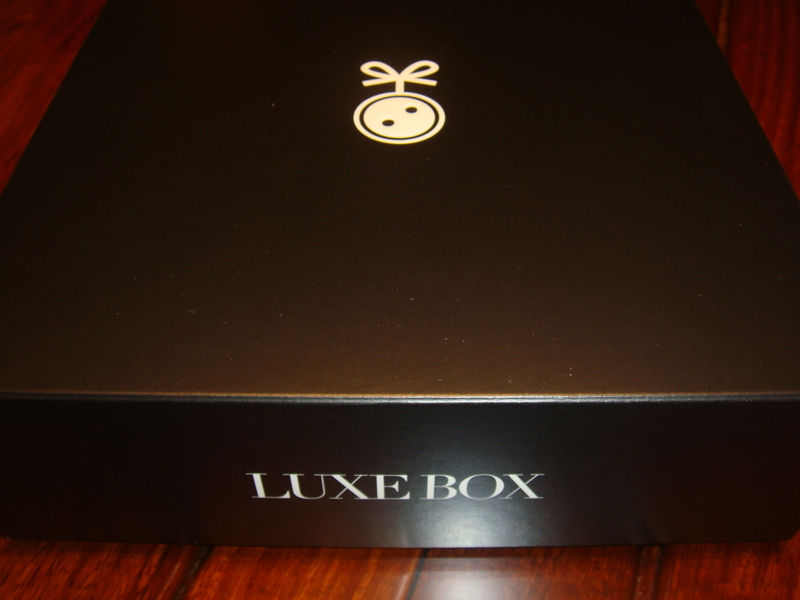 I look forward to receiving my luxe box every month! Who wouldn’t love receiving beauty samples? I’m a sucker for beauty products. I’m always interested in trying different brands and that’s why this box is a perfect way for me to do so. I’m very excited to try the products out in this month’s box! Basically, you receive a box of 4-5 deluxe sized beauty samples each month in a sleek, reusable black box. By “deluxe size,” it means these samples will last you more than your typical 1 or 2 time use. You can get a monthly ($12), quarterly (recurring every 3 months, $36) or yearly subscription ($120) + free shipping for the box. However, currently this subscription is only offered to Canadian residents. Hopefully they will be able to ship elsewhere in the near future! Also, they try to personalize your box by adding your name on the gift wrapping sticker & the card that the box comes with (Which is nice!). In the card, it describes each product & how to use it. It also shows how much it costs if you were to purchase the full-size amount of each product. This month, there are samples from Benefit Cosmetics, Lise Watier, Mereadesso & a bonus Teaopia tea kit. I’m a fan of benefit cosmetics and the fact that there are 2 samples from this company this month is amazing! The Benefit samples include a Posietint Poppy-Pink tinted lip & cheek stain and a B. Right! Moisture Prep Toning Lotion. I’ve been meaning to try the posie tint & now I can actually do so. The posie tint allows you to brighten your cheeks and/or lips with a nice pinky colour. The moisture prep toning lotion is basically used to allow your moisturizer to really sink into your skin. I just opened it up and it has a floral scent that’s not too overwhelming in my opinion. I’m also intrigued by the Mereadesso lip treat which is a primer for lipstick/gloss/lip liner. It looks like a normal lip balm when you put it on. The Lise Watier “Neiges” fragrance included has a nice floral scent to it. 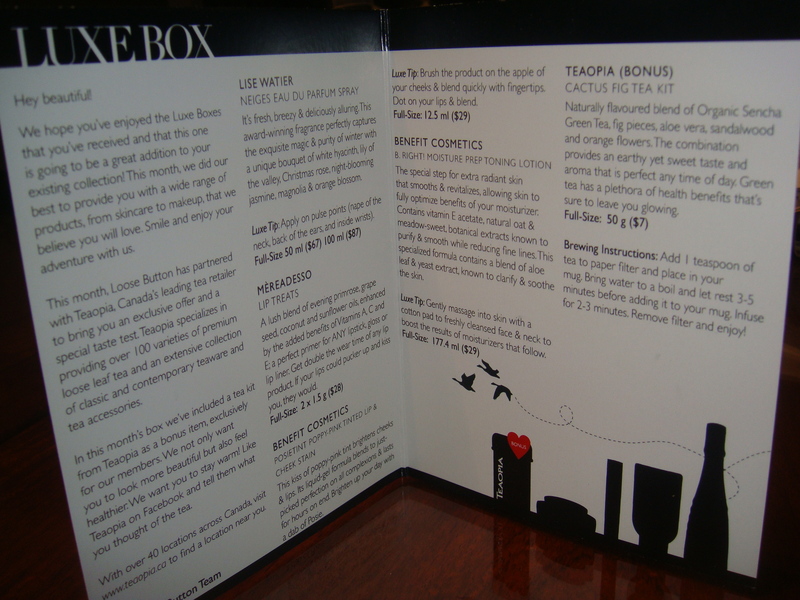 The bonus tea kit from Teaopia contains the “Cactus Fig” tea and there is quite a decent amount! I look forward to sipping this tea in the upcoming cold, winter season. December Luxe Box « take her word.